Back in '94 I did my first calendar. It was all about whitewater. This was one of the toons on that calendar, and it reflects something that ALL whitewater kayakers put up with . 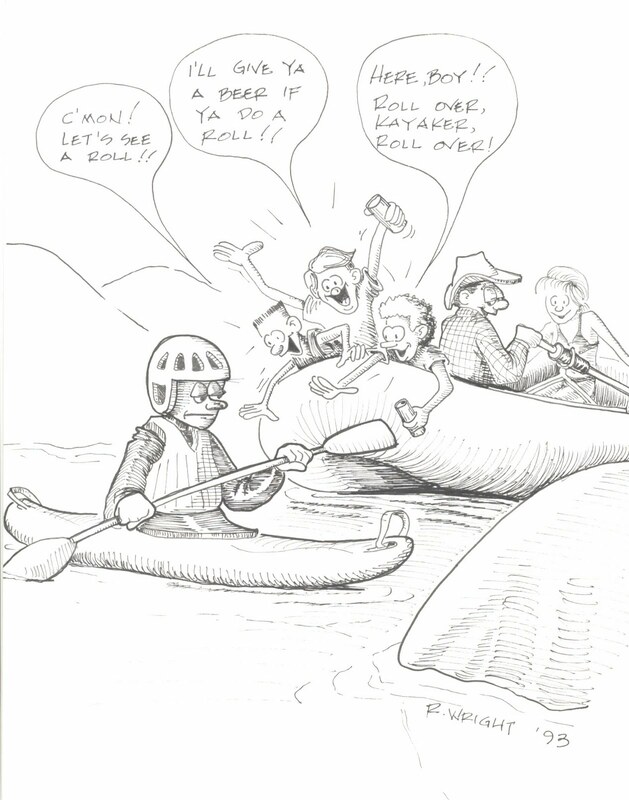 For some reason, everybody wants to see a kayaker do an eskimo roll. And yes, I have actually been offered a beer for doing a roll for the group of onlookers. Naturally, I have no pride, and promptly flipped over, only to set up, and properly flip the paddle in just the right way to come up quickly. In fact, half the group of rafters didn't even see it. They wanted me to do it again, but failed to offer another beer. So, I took my payment for the first roll, and happily paddled away. So, I felt this drawing properly characterized all the participants. The rafters are all rowdy, drunk juveniles, except the guide that is rowing them. He is too cool to perform such antics, and just knowingly smiles at the kayaker. Meanwhile, the kayaker is just disgusted at the loud-mouthed yahoos.